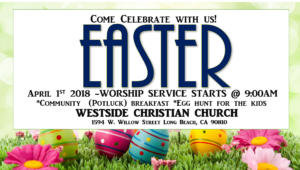 Westside church invites you to come and celebrate with us for Easter 2018. 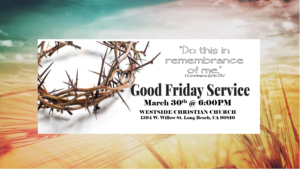 Good Friday service on March 30th starts at 6:00PM remembering the death of Jesus on the cross. Easter worship service on Sunday (April 1st) will START AT 9:00AM followed by the Annual Westside Community Breakfast (potluck) and the Egg Hunt for the kids. Easter is always a great experience at Westside and we invite you to be part of it.